Join us for the second instalment of our workdays in the hills above Henryd. 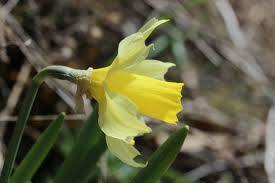 This hidden site is home to native Daffodils which produce a fantastic carpet of yellow in the spring. Our aim is to help maintain this site for its natural qualities and preserve this great display. Sadly Bracken is slowly engulfing the site and making it difficult for the Daffofdils to get enough light and resources to grow. Come and help us clear the dead Bracken so that the display in 2019 is just as great as ever.